Both these performances are well known to collectors. The Rosenthal is perhaps best served on Biddulph 040 (transferred by Ward Marston) where the concerto is coupled with other works by Chopin. But there is also a Pearl transfer, which enshrines, characteristically, more shellac noise but may also appeal by virtue of its more direct top. The Hofmann has seen service on VAI 1002 where it’s coupled with the other concerto and an excerpt from the E minor Allegro in a performance with the BBC Symphony conducted by Hamilton Harty – subfusc sound but fascinating and brilliantly played by all concerned, not least Harty, one of the premier accompanists of the day. Dante HPC002 has also transferred the two concertos. Hofmann’s performance with Barbirolli of the F minor is one of the most kinetic and dramatic around. Of indulgence, metrical games-playing, extended tempi there are no signs. The element of reserve that Hofmann brings works enormously to the work’s advantage – though of course the more flamboyant and overtly romantic responses of his contemporaries bring their own rewards. Of the transfer choices I would discount the Dante which did reasonable service but now sounds outclassed in matters of tone and frequency response. This Altara has been transferred at a higher level and the scuffles ironed out – but if you’re after Hofmann’s performance in a Chopin context then the repertoire strongly directs you to VAI who have first class transfers. Rosenthal had studied with Mikuli, a Chopin pupil and this informs his playing of the E minor concerto. He had absorbed traditional variants in his performances – though the cuts in the opening and closing movements were imposed by the record company in order to minimise the number of discs. Weissmann, one of the reigning house accompanists in Berlin, directs with considerable composure and control; his soloist plays with magnificent aristocratic refinement and largesse. The transfer is inclined to be a touch noisy. There’s a deal of swish and the copies used deteriorate toward side ends – the side join at 6:10 in the first movement is rather disruptive. My preference is for the Biddulph. 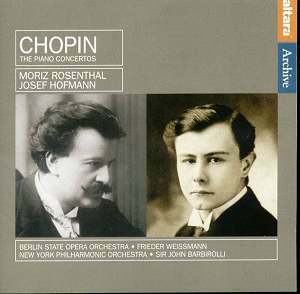 The pairing of Hofmann and Rosenthal makes sense; one a live recording in 1936, the other a commercial undertaking completed in 1931. Two indisputably great pianists and two great performances. The questions relate to pairings and transfers.